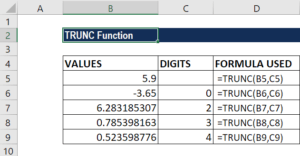 What is the TRUNC Function? 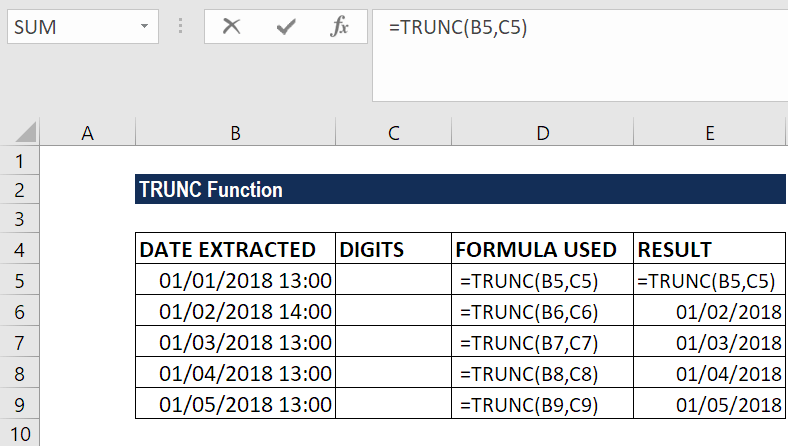 The TRUNC function is a Math and Trigonometry functionFunctionsList of the most important Excel functions for financial analysts. This cheat sheet covers 100s of functions that are critical to know as an Excel analyst. It removes the fractional part of a number and thus truncates a number to an integer. It was introduced in MS Excel 2007. In financial analysis,Financial Analyst Job DescriptionSee a real Financial Analyst Job Description including all the skills, experience, and education required to be the successful candidate for the job. Perform financial forecasting, reporting, and operational metrics tracking, analyze financial data, create financial models the function can be used to truncate a number to a given precision. It is also useful for extracting dates from date and time values. Number (required argument) – It is the number we wish to truncate. Num_digits (optional argument) – It is a number that specifies the precision of the truncation. If kept blank, it will take 0 as the default value. A positive value that is greater than zero, it specifies the number of digits to the right of the decimal point. Equal to zero, it specifies the rounding to the nearest integer. A negative value that is less than zero, it specifies the number of digits to the left of the decimal point. 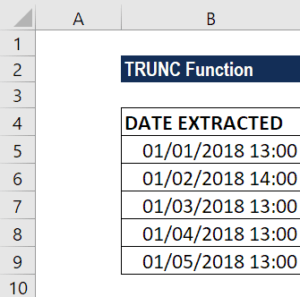 How to use the TRUNC Function in Excel? The TRUNC function does not round off but simply truncates a number as specified. The function can also be used to return a set number of decimal places without rounding off using the num_digits argument. For example, =TRUNC(PI(),2) will return Pi value truncated to two decimal digits, which is 3.14, and =TRUNC(PI(),3) will return Pi value truncated to three decimal places, which is 3.141. TRUNC and INT are similar functions because they both can return the integer part of a number. However, TRUNC simply truncates a number, while INT actually rounds a number down to an integer. However, for positive numbers, as well as when TRUNC uses 0 as the default for num_digits, both functions will return the same results. With negative numbers, the results can be different. =INT(-2.1) returns -3, because INT rounds down to the lower integer. =TRUNC(-2.1) returns -2.